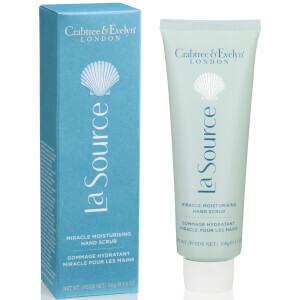 Treat your hands to the Crabtree & Evelyn La Source Moisturising Hand Scrub; a two-in-one formula infused with a Hydra Marine Blend of antioxidant-rich Green Seaweed Extract and Blue Sea Kale to cleanse and exfoliate. Utilising salt crystals and fine pumice, the luxurious treatment gently buffs away dead skin cells and impurities, whilst nourishing Palm Butter and Macadamia Nut Oil soften, condition and regenerate for long-lasting comfort. Expect smoother, younger-looking hands with ultimate moisture. Apply to clean, dry hands, massaging over the front and back, then rinse. For premium results use 2-3 times a week.